Last week I was psychically attacked. It was violent and unexpected. It happened after I spoke with someone about an event I was scheduled to teach. We set up a meeting time to fine tune some brainstorming. I turned off my phone and worked on a client. Then, I turned it on to this. Black, violent energy shot off the screen into my heart. My emotions immediately derailed. I was spirally down to a very depressed and terrifying state. I was not emotionally invested in this event so immediately knew I was not feeling my own emotions. I was processing the emotions of someone else. This is a waste of time and energy and sadly common for empaths and energetically sensitive people. 1. It comes from nowhere or is blown out of proportion. 2. You will feel very emotional (usually fear or anger.) and fixate on the person or event long afterwards. 3. 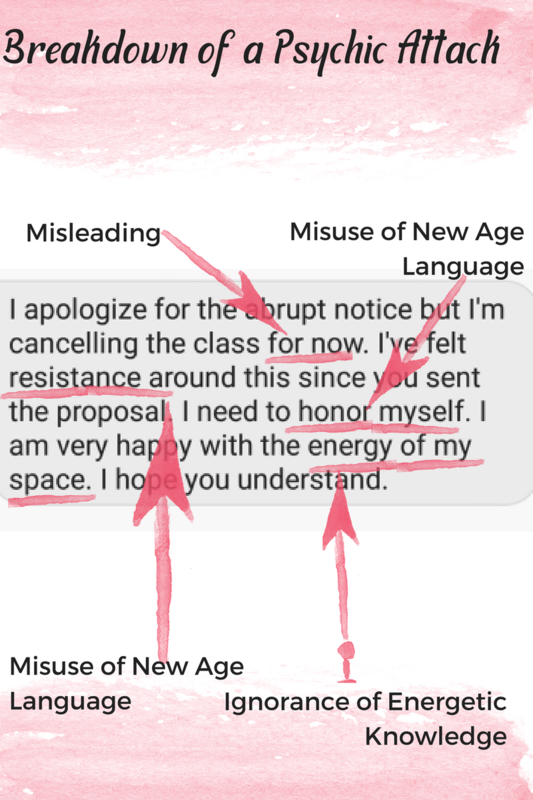 Misappropriation of New Age Language to Disempower. Case in point of the text. 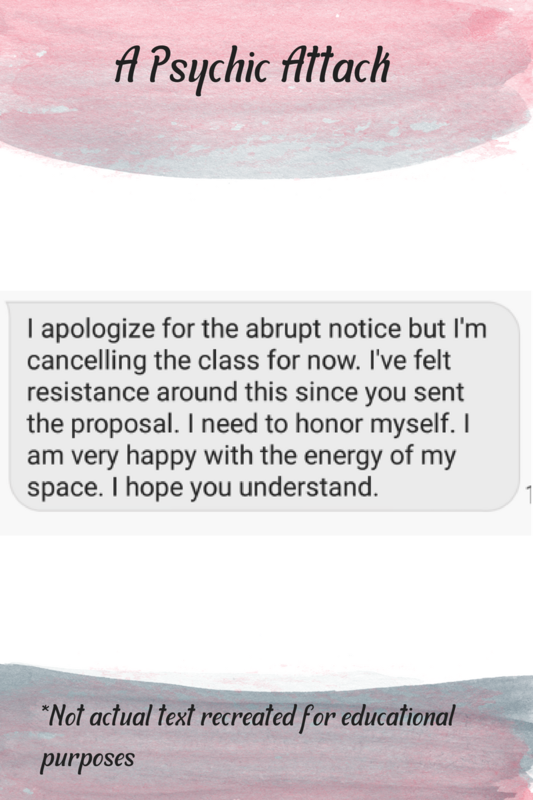 “I’ve felt resistance and need to honor myself.” is alluding that my energy was the cause instead of self work to relax the sensation or at least have a conversation around any unease in any relationship. 4. Ignorance of Energetic Knowledge. 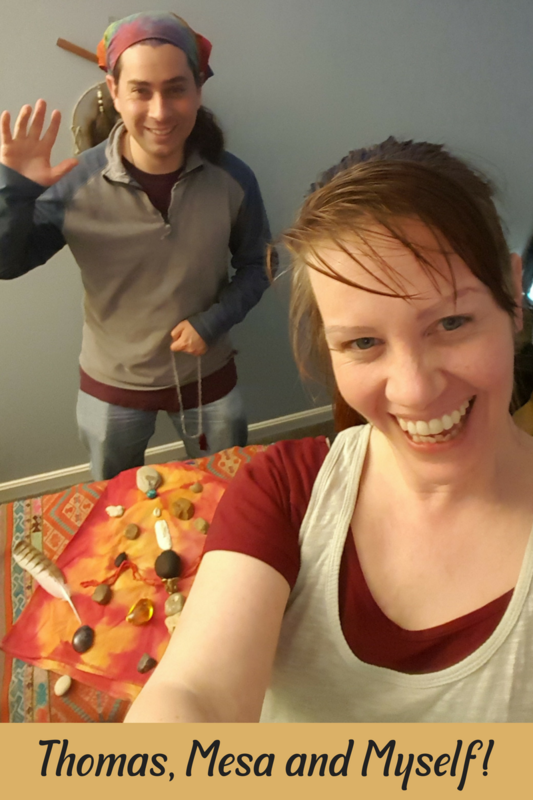 I mentioned in the telephone conversation that the singing alchemy bowls rearranged the energy of my house and would change the energy of the classroom space. The “I am very happy with energy of my space,” alludes to this. What isn’t understood is that to be balanced energy needs to move and change to establish flow. If this is not achieved then it will stagnate. Unmoving stagnant energy will cause more harm then good. Ignorance around this concept and lack of clarification possibly aids in the severity of the attack. All the boxes were ticked. Luckily I have skills. The attack sent me into a place of terror. It was blindsiding and unexpected. I pulled the energy out of my chest. Black spikes leaked black liquid in my heart chakra. My guides told me it was a sort of energetic poison designed to create lasting emotional imbalances. The spikes pined me in the emotion and the liquid deepened the effect. I cleaned the space by removing the energy. The terror dissipated. Anger filled its place, hot and hungry for vengeance. Energetically anger is a higher frequency than fear. It was a sign that I was improving. However, it was a deep anger that border lined on rage with no care for self preservation. This was not balanced. I needed help. I could feel the trigger going deeper and with it rage and a desire to attack in response. This indicated that there was still energy inside of me that wasn’t mine. The desire to attack was my body trying to push it out. Allowing anger can be a good way to draw a boundary but here it was imbalanced. I looked at it energetically and saw if I did this, it would turn into a long drawn out thing. Not a good action and the anger was getting deeper and deeper and deeper, holding it in hurt a lot and letting it out was going to cause something worse. I breathed. I exercised. I did energy medicine. The anger burned. It was taking all my control not to lash out at those around me and perpetuate the attack. How to find and pull energy that isn’t yours from your body? 1. Ask the question, “Where is the energy that doesn’t belong to me?” Look for where your attention goes. Also look for how your attention goes? Do you feel it, see it, hear it, know it, or even smell it? 2. Place your hand over the area and get more information as to what your feel? Does it feel like it is in your body? Does it feel emotional? What sort of information are you getting from it. 3. Take your hand and rotate over the area from right to left in a counterclockwise motion. This creates a spiral, which is the energy of change. This also opens your body up energetically so it can let go of any energetic debris in the area. 4. Pay attention to any differences you feel. Does your mood shift? Do you feel the energy moving? 5. If it calls to you, see if you can pull out anything that may be causing the issue. Ask your guides and your own divine knowledge what the functions and purposes of the structures you find are. 6. Close the area circling left to right (clockwise) over the area. 7. 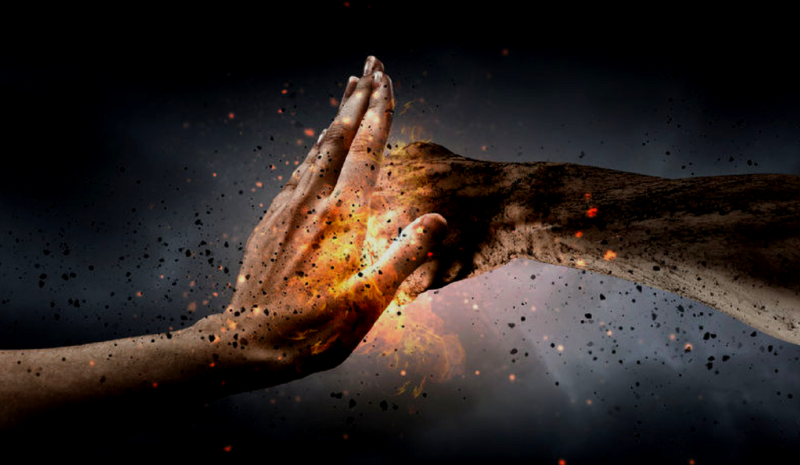 If the effects of the attack are still strong, find an energy practitioner for further help. This was out of my skillset to handle on my own. So I got help. I scheduled a session with shamanic practitioner, Thomas Mooneagle. Shamanism a type of energy medicine that works with earth spirits. He used two special rattles and shook them around my field to invite helper spirits in to balance the energy around me and inside of me. He also used a Mesa, or sacred rocks and statues on a special cloth to set and change the energy in a particular pattern. Energy can form structures called patterns to help practitioners discern what is asking to be changed. Thomas quickly found that the cause of the issue were hoocha and entities. In Shamanism, hoocha is stagnant energy that is very dense. It is so dense that it doesn’t flow out on its own. Moreover, hoocha can make people aggressive and if thrown can make the recipient aggressive as well. He asked an earth spirit to come down and eat the hoocha. In the session Thomas found that the energy was a curse. Curses are meant to tie people down, take their energy and harm them. They are common in spiritual abuse. Thomas asked earth spirits to clean out the aggression and unclean energy. None of it was mine. None of the anger or terror were my emotions. I left feeling very relieved and calm. It still took a couple of days to move completely back to normal, but I no longer felt the urge to strike out at anyone. Psychic attacks are no joke. You can feel or process energies that do not belong to you. It is a waste of time. If somebody is cruel to you uses New Age lingo to hurt it is spiritual abuse. Get help if you need it and learn to protect yourself.